Create your ideal schedule by being intentional and prioritizing your time. Sometimes the answers we need are simple and uncomplicated. So much so, in fact, that we miss them or we don’t give them the attention they deserve. I created a system for myself that I call “intentional calendaring” which has increased my productivity and maximized my performance. I am here to tell you that the growth and profitability of my business have been positively impacted by this one idea. In fact, it is the one idea that can be most responsible for your success on every level, both personally and professionally. So, here’s how it works. Start by looking at the calendar for the entire year ahead and blocking out time according to your priorities. Prioritize those items you have determined are most important and calendar them first. Etch them in stone and only change them if you absolutely have to. Let me share with you five steps to creating a successful calendar. Yours may look a little different depending on your own priorities. And you might be surprised at what I schedule first. 1. Schedule personal rejuvenation time. Start with planned time for yourself. Yes, you read that correctly – YOU first. I am not sure why so many of us feel guilty about taking time for ourselves. We are not bringing our best to anyone or anything if we are running on empty. Our helpful flight attendants tell us to put on our own oxygen masks first before helping others! But so many of us have work versus free time backward because we are taught to take vacation time as a reward. With many companies’ paid time off plans, you need to work for a year before earning any vacation time. Often well-intended vacation plans are thwarted due to work priorities taking up the calendar, and there simply is no room left. Don’t underestimate the importance of rejuvenation. For us to perform at an optimum level, we have to take regular time for self-care, and really believe that it’s not a selfish activity. 2. Schedule family time and special events. Family is a top priority for me. Therefore, I have this one second on my list. Once I have scheduled my own rejuvenation time, I schedule family vacations, reunions, weddings, and other special events in my calendar. 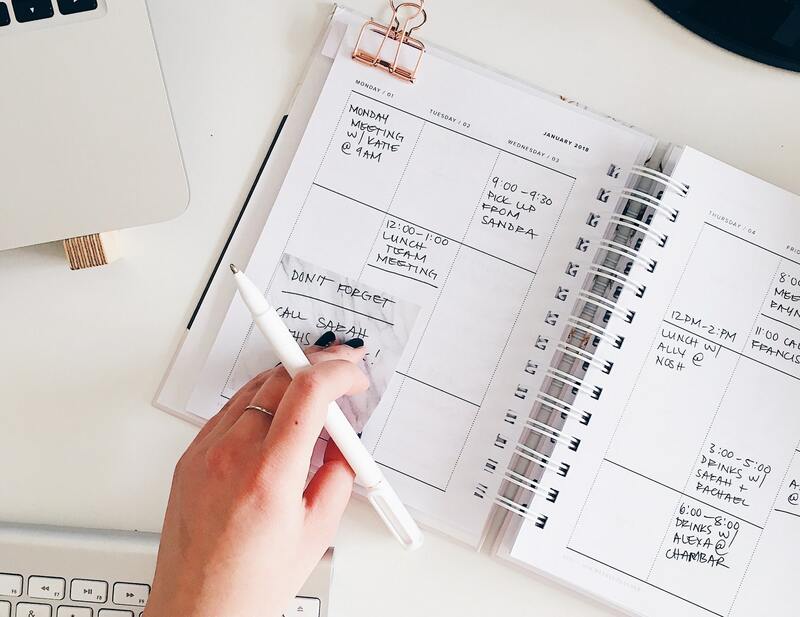 Fortunately, most schools provide their academic calendars a year or more in advance, allowing you to know when all of those parent meetings, choir concerts, athletic tournaments, and school breaks are going to happen. Volunteering in my community and industry group is important to me, and I serve on multiple boards. If I haven’t received the schedule of the next year’s meetings by the beginning of the fourth quarter of the current year, I reach out to ask for the detailed list of events, so I can get the dates on my calendar for the year ahead. 4. Schedule personal growth time. Next, I schedule time in the calendar for self-development. This includes items such as industry conferences, special training, and education that will help me to grow personally and professionally. Several years ago, I learned an investment formula from management expert Brian Tracy who recommends setting aside a portion of your income to invest in your own development. Think of it this way, if you become a better leader in your organization, you will be better equipped to develop the leaders in your organization, and your organization will only benefit because of it. That’s been my experience. 5. Schedule your business responsibilities. You now have a calendar with a lot of days blocked out for your personal rejuvenation, time for your family and other activities you enjoy such as community involvement, and personal growth. What you have left open is the time that you can now fill with your various business responsibilities. I’ve found that having fewer days for my work meetings and tasks makes me more focused, and I’m able to accomplish more in less time. Consider, when you have a vacation you are scheduled to take, you tend to get more accomplished in the week before you leave than you did in the several weeks prior. Something about the compressed time makes us more efficient. That’s intentional calendaring in a nutshell. It’s April. If you haven’t calendared for 2019, it’s not too late to sit down and do it. Yes, you may have to tinker with this idea based on activities, emergencies, etc. that inevitably come up. But, I have learned that starting with a blueprint for a successful year gives you a much better chance of actually having one. Janelle Bruland is an entrepreneur, author, speaker, and high-performance coach who inspires others to live impactful and successful lives. She is Founder and CEO of Management Services Northwest, a company she started in her living room in 1995 and has grown into an industry leading company, named one of the Fastest Growing Private Companies by Inc. magazine. The CPO of Microsoft, Mike Simms, describes her as a true pioneer in her field. Janelle is also the Co-Founder of Legacy Leader, a leadership development company that teaches business professionals how to build a legacy, transform their leadership, and love their life. She is the author of The Success Lie: 5 Simple Truths to Overcome Overwhelm and Achieve Peace of Mind. Janelle is a lifelong resident of Whatcom County, Washington and is married with five children. In her leisure time, she enjoys spending time with family and friends, traveling, golf, as well as keeping fit through various sports and activities.